Strawberry and Blueberry are ready to find new homes. Homeless kittens Strawberry and Blueberry came to us separately, but fate brought them together when they ended up in the same foster home. 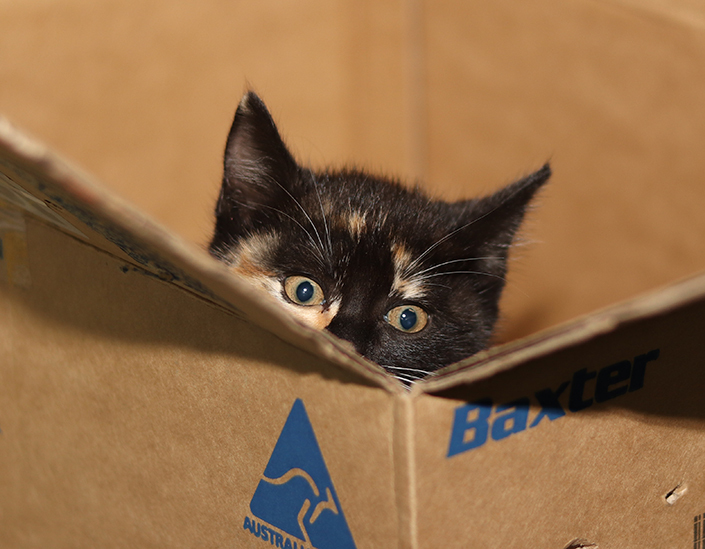 Strawberry was left in a box outside our North Melbourne shelter. Luckily, one of our attendants spotted the box on her way in to work and went to investigate. Upon finding the scared kitten cowering in the box, she rushed her inside to be checked over. 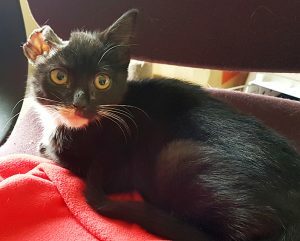 Thankfully, Strawberry was ok.
Less than a week later, our animal ambulance rescued a kitten who had a nasty injury to her right ear, which had been torn. It had likely been that way for some time. We don’t know what happened to Strawberry and Blueberry in their first weeks of life, but finding each other and their foster families was probably their first experience of love and care. After a couple of weeks in foster care with the attendant who found Strawberry, the pair moved into another foster home for continued care. Our Shelter Medicine Team also performed surgery on Blueberry to remove the damaged part of her ear. Foster carer Trepheena and her family have always loved fostering scared kittens, helping them gain confidence to get them ready for their loving forever homes. Strawberry settled quickly into our home and over the first few days, her playful side emerged,” said Trepheena. “After a week, she was a super enthusiastic player, leaping around and having a great time. It is always great fun to help kittens learn how to play. “Poor Blueberry was very quiet when she came to our home. She didn’t want to play with Strawberry or with us. For Trepheena, fostering is a family affair, with plenty of love to go around. “Both kittens met my very calm Labrador (who loves kittens and cats). Blueberry was scared and didn’t go near him. Strawberry was initially scared but then started pouncing on his tail. My nine and 11-year-old sons are experienced kitten foster carers, and both boys spent a lot of time helping the kittens build confidence with handling and start playing. 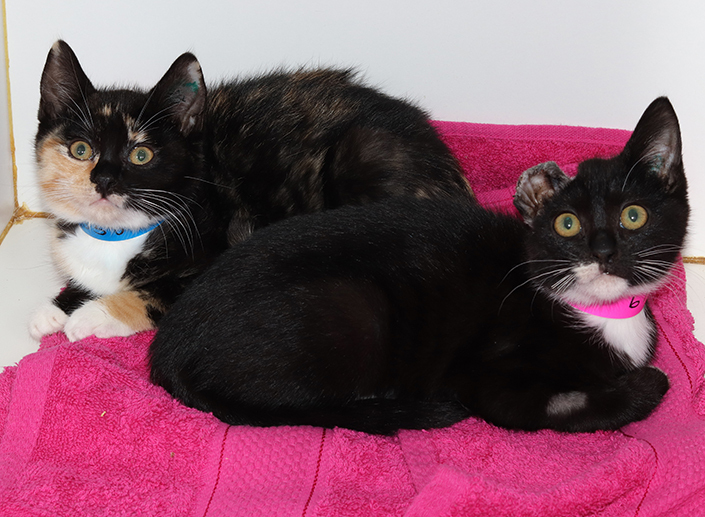 Strawberry and Blueberry are now ready to find loving forever homes of their very own. View their adoption profiles or meet them at our North Melbourne shelter. “Strawberry is super playful and loves to run around chasing toys. 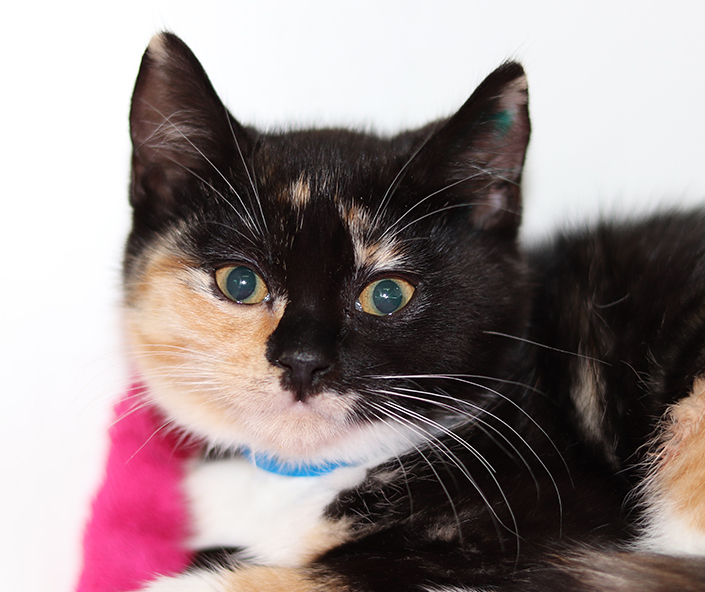 Blueberry is a lovely, gentle kitten who loves to cuddle and play,” said Trepheena. Not ready to adopt? You can still help by donating today to support the treatment and care of homeless pets, just like Strawberry and Blueberry.